A couple of weeks back PilatesTree.com asked via Facebook “how much self practice do you really put in?”. It’s a really interesting question to ask professional Pilates teachers, not least because we so often seem to prioritise teaching over working on ourselves. When I first started teaching I used to “do” the class that I was teaching, and it took me a while to realise that this was a really good way to develop some bad habits (never mind that my mat was not the optimum place to be teaching from all the time..). I’ve struggled for some time with conflicting ideas around Pilates teachers’ responsibility to be aspirational figures (see ‘What should a Pilates teacher look like?‘) and, of course, what we do should be more important than how we look. If we finish teaching a class and then adopt a collapsed posture we’re doing a lousy job of reinforcing what we teach. “Do as I say, not as I do” is rarely a powerful teaching message. The answer, naturally, is ‘every day’. Hence, there are NO DAYS OFF. Practice making permanent = we become good at what we do often, which brings us back to the post-class slouching Pilates teacher. A state of fitness is not the result of a couple of hours per week of exercise. That may well form a part of fitness, but if we practice being great for 2 hours a week, and then the remaining 110 hours (assuming a generous 8 hours sleep per night) practicing being mediocre, or worse, we don’t need NASA to tell us what the outcome will be. 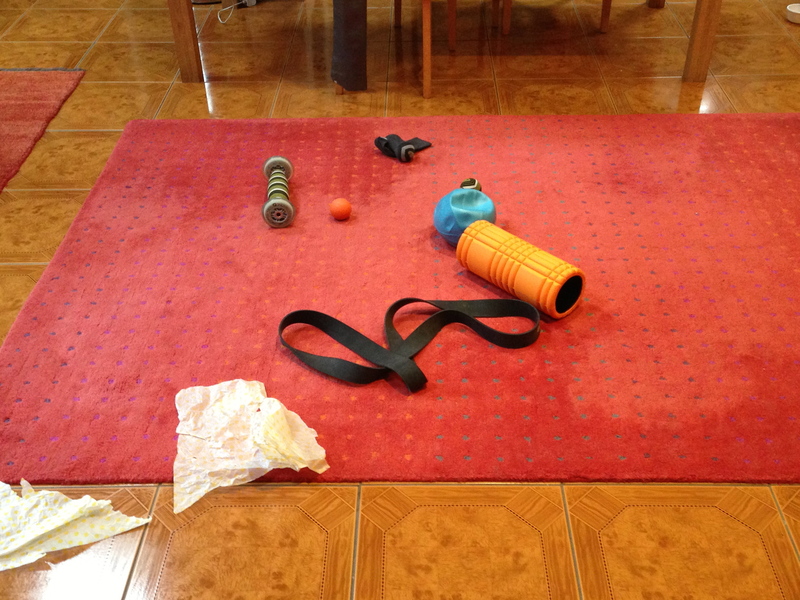 Typical view of living room floor (tissue paper is for the cats to play with). I was unusually reticent about answering the original question on PilatesTree….in part because I know that I can’t pretend to do anything resembling a Pilates class more than once a week. Preferring to answer my own question (“How often should we be practicing being amazing?”). As of this year, I do something in pursuit of being better as often as it crosses my mind, and this means at least every day. I don’t work out every day, but I try to practice something that I need to improve daily, whether that be a skill/movement, or mobility. I’m very lucky to be married to a woman who shares my passions/obsessions, and evenings in front of the TV usually involve one, or both of us rolling various body parts on sundry firm objects, or indulging in mutual ‘quad smashing’ (For a visual on how to do this to a massive weightlifter, or your loved one, click here, and remember: “Foam rolls are for children”). Talk of my idiosyncratic home life may have me straying off the point. Here’s the thing: Yes, practice Pilates, yoga, boot camp, karate…whatever’s your poison (passion? ), at least once per week AND practice being a better Homo sapiens every day. In the middle of a TV show I was watching the other night (I put my hand up here and acknowledge that I was making no effort to be better at the time), I heard the line “Clean water is a human right.” It sounded weird at the time – I think we’re often too quick to award ourselves rights (argh! Rabbit hole! Yes, ideally every living human should have access to clean water). Ethical quagmires aside, could we say that “an optimally functioning body is a basic human right”? I hope so, and if we’re agreed upon that, we have to remember that “with rights come responsibilities”. We have the basic human responsibility to maintain our bodies in such a way that we are able to best express our genetic heritage. In acknowledgement of the inspiration for this post, here’s Kelly Starrett. Not my favourite MobilityWOD video (and he no longer advocates icing) but maybe it can serve as a way in to the goldmine for you – he’s ALL about being better at EVERYTHING.